Tonight, Bishop Silva will be celebrating the anniversary by holding a first time ever public Rosary at the Cathedral of Our Lady of Peace, Honolulu, 7:00 P.M.
On Saturday, there will be a nationwide Rosary Rally to commemorate the 90th Anniversary of Fatima. You still have time to attend a Rosary Rally in your state. 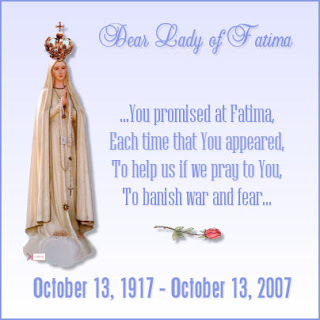 Feel free to post the above Fatima graphic on your blog as a way of honoring our Lady. The accomplishment of the divine will is the sole end for which we are in the world. To do the will of God man must despise his own; the more he dies to himself, the more he will live to God. Entire conformity and resignation to the divine will is truly a road on which we cannot go wrong, and it is the only road that leads us to taste and enjoy that peace which sensual and earthly men know nothing of. As in heaven Thy will is punctually performed, so may it be done on earth by all creatures, particularly in me and by me. Thou alone knowest best and what is for my good. As I am not my own but altogether Thine, so neither do I desire that my will be done, but Thine, nor will I have any will but Thine. 2) Only for today, I will take the greatest care of my appearance: I will dress modestly; I will not raise my voice; I will be courteous in my behavior; I will not criticize anyone except myself. 10) Only for today, I will have no fears. In particular, I will not be afraid to enjoy what is beautiful and to believe in goodness. Indeed, for twelve hours I can certainly do what might cause me consternation were I to believe I had to do it all my life. The following bloggers have been kind enough to award my blog with the Mathetes Award. Mahalo nui loa for this honor. I really appreciate it very much especially since your blogs are most deserving as well. Thank you again. If I missed anyone, I will amend it. God bless you all. 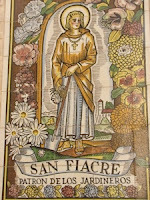 Diana of St. Fiacre's Garden may not like one in the #1 position. I shall remind myself of the labors He undertook in preaching, of his weariness while traveling, of the temptations He suffered while fasting, of his vigils while praying, and of the tears He shed out of compassion. I will remember, moreover, his sorrows, and the insults, spittle, blows, ridicule, rebukes, nails, and all the rest that rained down upon Him in abundance. The temple of the spirit is raised through work and suffering; and I would add that suffering counts for more than work. Many people would be ready to accept suffering so long as they were not inconvenienced by it. "I wouldn't be bothered by poverty," says one, "If it didn't keep me from helping my friends, educating my children, and living respectably." "It wouldn't bother me," says another, "So long as people didn't think it was my own fault." Or another would be willing to suffer evil lies told about him as long as no one believed his detractors. An unpitied pain wins greater merit before God. Never say to God: "Enough"; simply say, "I am ready!" Try to resemble that holy soul who wouldn't give up the least part of her sufferings so as not to lose the merit thereof. Suffering is a short pain and a long joy. When it is all over, you will not regret having suffered; rather you will regret having suffered so little and suffered that little so badly. To suffer much, yet badly, is to suffer like reprobates. To suffer much, even bravely, but for a wicked cause, is to suffer as a martyr of the devil. To suffer much or little for the sake of God is like to suffer like saints. What I suffered is known only to One for whose love and in whose cause it is pleasing and glorious to suffer. "on one of my visits to the missions, I went to a leper colony in Buluba, Africa, where there were 500 lepers. I brought with me 500 silver crucifixes, intending to give one to each of the lepers-this symbol of the Lord's Redemption. The first one who came to meet me had his left arm eaten off at the elbow by the disease. He put out his right hand and it was the most foul, noisome mass of corruption I ever saw. I held the silver crucifix above it, and dropped it. It was swallowed up in that volcano of leprosy. All of a sudden there were 501 lepers in that camp; I was the 501st because I had taken that symbol of God's identification with man and refused to identify myself with someone who was a thousand times better on the inside than I. Then it came over the awful thing I had done. I dug my fingers into his leprosy, took out the crucifix and pressed it into his hand. And so on, for all the other 499 lepers. From that moment on I learned to love them." From Treasure in Clay: The Autobiography of Fulton J. Sheen. He, the most beatific and most joyful, did make Himself most wretched in order that through His infinite suffering He might redeem man and save him from everlasting and unspeakable pain. I will attempt day by day to break my will into little pieces. I want to do God's holy will, not my own. I thank God that now when I preach I shall be able to say instead of 'dear brethren,' 'my fellow lepers. Christ one day said to St. John of the Cross, 'John, what recompense dost thou ask for thy labors?' He answered: 'Lord, I ask no other recompense than to suffer and be condemned for Thee." I began to understand that the love of the sacred Heart without a spirit of sacrifice is but empty illusion. It's a form of trade, you see. I ask God for souls, and pay him by giving up everything else. How terrible, I thought, that no act of love is ever made in hell! And I told God that I was ready to go there myself, if it pleased him to contrive, in that way, that for all eternity there would be one loving soul in that abode of blasphemy. I am so thrilled that this publication will be available to Catholic parents! I just placed our order. Can't wait to start searching for a quality Catholic school for the Joe. Today the Cardinal Newman Society announced the publication of a new comprehensive college guide for students and parents, The Newman Guide to Choosing a Catholic College: What to Look for and Where to Find It. Edited by Joseph A. Esposito, The Newman Guide will be officially published on Nov. 1, 2007. The “Joyfully Catholic” colleges are: Christendom College, The College of Saint Thomas More, Franciscan University of Steubenville, Magdalen College, Thomas Aquinas College, The Thomas More College of Liberal Arts, University of Dallas, and the University of St. Thomas (Houston, Tex.). The “Born from the Crisis” colleges are: Ave Maria University, Holy Apostles College & Seminary, John Paul the Great Catholic University; Our Lady Seat of Wisdom Academy, Southern Catholic College and Wyoming Catholic College. The “Fighting the Tide” colleges are: Aquinas College (Nashville, Tenn.), Belmont Abbey College, Benedictine College, The Catholic University of America, DeSales University, Mount St. Mary’s University and St. Gregory’s University. H/T to Deena who is in my Catholic homeschooling groups. 4. Do some of your schooling at Barnes and Noble or Starbucks. Seriously. Take the Friday freewrite to the mall or the local coffee house. Finish your math for the week at the library or at a park. Do you see a pattern here? Get out of the house more, not just for music or dance lessons and errands. One of the two books I purchased from The Antique Mall Books was the autobiography of Archbishop Fulton J. Sheen, Treasure in Clay. I had previously read the biography by Thomas Reeve entitled America's Bishop. I thought that was an excellent book. I also thought I had learned as much as I could about Fulton Sheen by reading that one book. I was wrong. Archbishop Sheen's autobiography, written of course by the archbishop himself, is so engrossing, and so hard to put down. Let me put it this way, blogging? I haven't had time to do my usual blogging (although you may not have even noticed) Who has time for blogging, when I have the next chapter of the book to look forward to? "Clay has to be molded, and that is done primarily in the family, which is more sacred than the state..."
"...The molding of the clay was done by great sacrifices on the part of my father and my mother, who would deny themselves every personal comfort and luxury in order that their sons might be well clothed and well cared for. Our family life was simple and the atmosphere of our home Christian. Grace was said before and after each meal; when we had visitors, none of us was permitted to sit at table without wearing a coat and tie; the Rosary was said every evening; the priest so the cathedral visited the home once every week; and visits of old country cousins were very frequent." "On Saturday, September 20, 1919, I was ordained a priest, by the grace of God, in the cathedral at Peoria. The stirrings which the Holy Spirit put in my soul in the early days were now fulfilled-or were they? I was now a priest. Yes, But is not that just half the story? I never asked myself that question the day I was ordained. In due time, and not in any easy way, I was to learn that a priest is also a victim..."
Later on in the book he goes into more detail on the sufferings that made him not only priest but victim as well. "The church is always judged by the bishops; that is the lesson of the Book of Revelation. And in many instances in which St. John writes about these churches, he said: 'I know your works," that is your administration, finances, social service and schools. I know all of these- then there comes a 'but'...What was forgotten was love of Christ, or orthodoxy or self-denial. I once heard of a preacher who was developing the theme about the three young the three young men who were called by Our Lord. Each of them said: 'I will go, but...' and then each gave an excuse. The preacher ended up by saying: 'It seems to me that many people are going to Hell on their 'buts' Well, here there is a 'but', such as lost love, a cold church or allowing false prophets to teach. The only two churches that were approved without any criticism were the churches that suffered. It is a small wonder to me that this man of God will someday be proclaimed a saint in the Roman Catholic church. 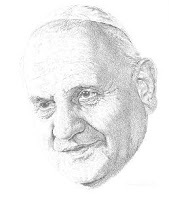 His love of Christ and the way he lived his life in generosity to the less fortunate, the people he brought into the Catholic church are just a few examples of his saintliness. In speaking with a friend today, she mentioned that our mutual friend Fr. Edwin Duffy knew Archbishop Sheen personally. (Just so you know, Fr. Duffy also knew Gil Hodges!! And, Richard Harris, the actor). She asked him what was he like. She shared it with me but I will ask Father Duffy myself so I can be accurate. I am very curious to know as I admire Archbishop Sheen tremendously. I do hope you are able to obtain and read this marvelous book, especially, if you are a priest. Obedience is the only virtue that implants the other virtues in the heart and preserves them after they have been so implanted. Obedience is the mortification of the members while the mind remains alive. Obedience is unquestioned movement, death freely accepted, a simple life, danger faced without worry, an unprepared defense before God, fearlessness before death, a safe voyage, a sleeper's journey. Obedience is the sepulcher of the will and the resurrection of lowliness. If you are ordered to eat meat, be extremely careful not to make the slightest resistance to obedience, for you will render more honor to God by eating flesh meat through obedience than by fasting on bread and water of your own volition. If you begin to grieve at this, to judge your superior, to murmur in your heart, even though you outwardly fulfill what is commanded, this is not the virtue of obedience, but a cloak over your malice. The virtue of obedience makes the will supple. It gives the power to conquer self, to overcome laziness, and to resist temptations. It inspires the courage with which to fulfill the most difficult tasks. Thus the abbot john without a single though as to whether it would do any good or not, with great and prolonged labor watered a dray stick for a whole year on end when told to do so. Heaven sometimes approved this kind of obedience with miracles. - St. Ignatius of Loyola. I originally posted this last year on October 9th, 2006. Today is Columbus Day. It is the federal holiday set aside to honor the man credited with discovering America. Here in Hawaii however, it is not known as Columbus Day but as Discoverer's Day. Funny, but I haven't seen much in way of honoring Christopher Columbus today. So therefore I am posting an entry to honor this devout Catholic explorer. From reading a little on Columbus, I learned he was a scholar. He liked to surround himself with learned people, of all nationalities and walks of life. Columbus first went to sea at the age of 14. When he grew up he was convinced that there was a westward route to Asia. It was something he was determined to pursue but the cost of the voyage would be high. He needed the backing of a powerful nation. He first approached the king of Portugal, the country where Columbus was living. But the king was advised that Columbus' idea was riduculous and he therefore rejected Columbus. 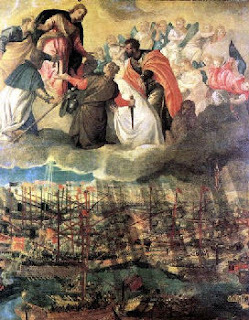 He then approached the leaders of his hometown of Genoa. They too turned Columbus down. The main reason for this being that since he had left Genoa, the did not have confidence in this absent native son. He tried different countries including England, but the rulers all turned him down, including King Henry VII. 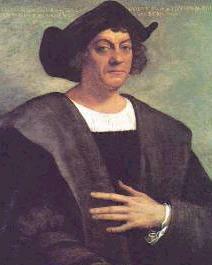 Columbus, a widower by this time, was running out of options so he took his small son Diego and left Portugal for Spain. There Queen Isabella would for five long years raise his hopes and dash his hopes. Columbus was very disheartened by this time, especially since he had with him his small son. One day he took the boy to the local monestary in order to seek shelter for his son. 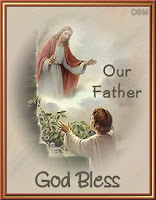 He plead so well for his son's sake, that he caught the attention of a friar, Father. Juan Perez. Father Perez recognized that this man was no common begger and he invited Columbus to talk. Columbus poured out all his ideas while Father Perez listed. By the end of their conversation Father Perez was as excited on the prospect of this exploration as was Columbus. He saw an opportunity for Columbus to bring the Gospel to the Indies. The next day, Father Perez went to see Queen Isabella. He had no trouble getting an audience with the queen since he was her confessor. During this meeting Father Perez plead Columbus' case for him. The queen then ordered that Columbus be summoned to her court immediately. "On April 30, 1492, the famous "Capitulations" were signed by the Spanish court. He was to be given the title of "Admiral of the Ocean Seas", governorship of any lands he might find, and a tenth of all profits resulting from the expedition. Also, he was to be provided with three ships, in whcih to carry his expedition; these would be outfitted at the expense of Spain." from Our American Catholic Heritage by Albert J. Nevins, M.M. H/T to John and Sue C. for sharing this inspirational video. I told the lovely ladies at View from the Pews that I would be joining in their Bloggers Praying for Peace project. The following is this week prayer. 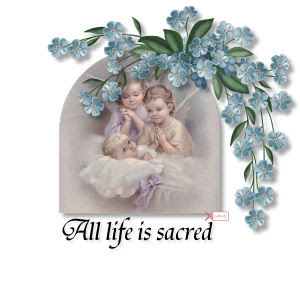 We pray for all people. but all are Your children. to know and understand them. 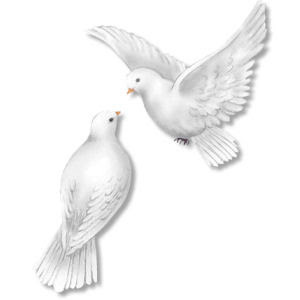 and all people may be blessed with the fruit of peace. that You are the Father of all. 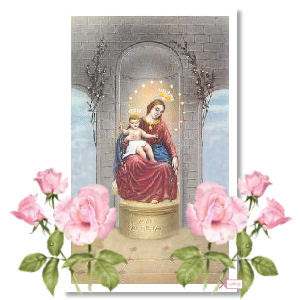 At the command of Mary all obey, even God.